Well, Ernal, who quit school after the 9th grade, had read “The Rhyme of the Ancient Mariner” by Samuel Coleridge Taylor and was particularly taken by the description of the gracefulness of the bird and chose the name for his boat. Anyone who has seen the Albatross on the water will recognize the wisdom of his name choice. It might be worth noting that, contrary to popular notion, the poem makes it clear that ancient sailors considered the Albatross to be a good luck omen. 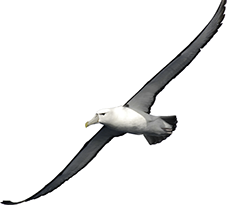 It is the killing of an Albatross that is thought to be bad luck. During the 1930’s and immediately after WW II the world of sport fishing was developing and changing dramatically. The sport developed in Florida and off Ocean City, MD and Montauk, NY and a few of the northern fishermen went to Florida in the wintertime. On the way north in the spring several stopped in Hatteras and were more than willing to share information with Capt. Foster. 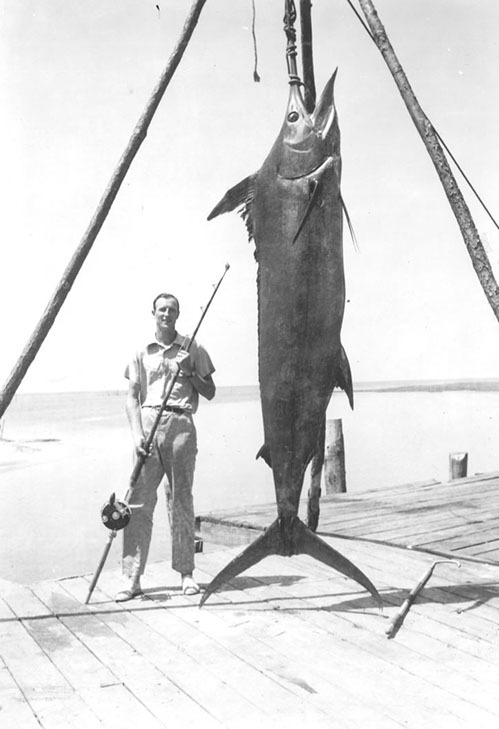 First blue marlin caught in Hatteras in 1937 by Hugo Rutherford. Also, several pioneering anglers had noted the close proximity of the Gulf Stream to Hatteras and had made exploratory fishing trips to Hatteras. 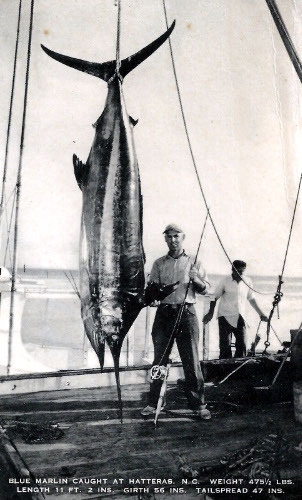 In 1937 one such angler, Mr. Hugo Rutherford, hired a local captain and they caught the first blue marlin landed off Hatteras, a 570 lbs fish. However, the winds of war were upon us and that angling feat received little notice. The Albatross Fleet was the pioneering sport fishing operation in North Carolina and had the good fortune of being involved in several milestone events. In June of 1951, Capt. Ernal and his 1st mate Gaston (his youngest brother) had a charter from PA that was comprised of a group of older gentlemen who wanted dolphin and amberjacks. Well, Capt. Ernal had been seeing a lot of blue marlin and had recently purchased a heavier rod and reel that he thought would be strong enough to catch one. So he rigged up a Spanish mackerel and put it out. And, almost immediately, he hooked his marlin. In unison the charter declared that they had not come Hatteras to work that hard and told him that if he wanted it that bad then he should wind it in! So he did. They landed the 475 lbs. fish after a 2 hour battle and brought it to the dock. Aycock Brown was called, his pictures went out to every sports page in the country and, almost overnight, Hatteras became known as the destination for anyone looking to catch a blue marlin in the USA. Betsy Walker (left) was the first woman to ever catch a blue marlin north of Florida. That above mentioned catch caught the attention of a couple from Richmond, VA who were ardent big game anglers. 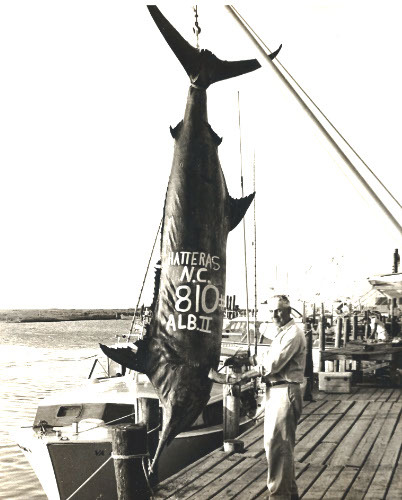 So in the summer of 1952 Mr. & Mrs. Ross Walker chartered the Albatross II for a week of blue marlin fishing. 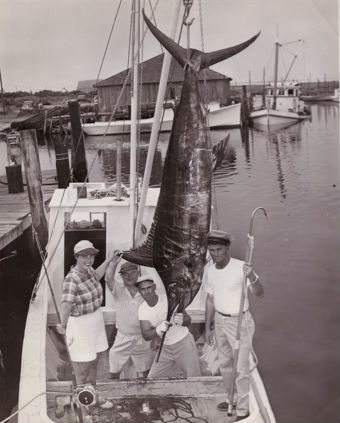 During that week Mrs. Betsy Walker caught a blue marlin and, in so doing, became the first woman to ever catch a blue marlin north of Florida. That catch also received widespread publicity and big game fishing and Hatteras became even better known. By the mid-’50s there were ten charter boats operating out of Hatteras and both the ports of Morehead City and Oregon Inlet had established fleets. Fishing was going well and billfish were being brought to the docks daily. The Albatross Fleet was thriving. Capt. Oliver O’Neal ran the Albatross III, Capt. Ernal ran the Albatross II and Capt. 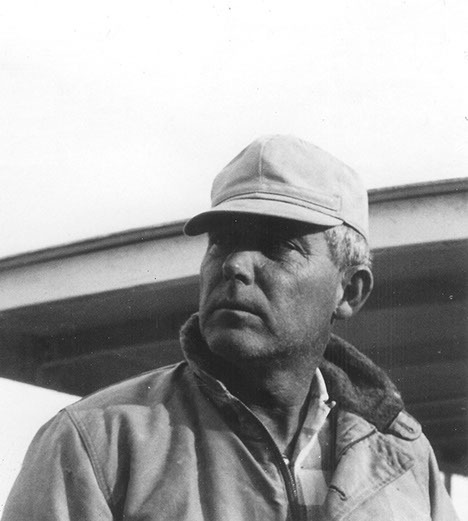 Bill Foster was the captain of the Albatross. Business could not have been better. Then, in August of 1958, a remarkable event occurred in Hatteras. A couple arrived on their honeymoon. They were from “up north” and they shared a love of fishing. Dr. John “Jack” Cleveland and his wife Ellie booked Capt. Bill for a week of marlin fishing. Their pursuit of the biggest fishing prize there is, a blue marlin, paid off. Dr. Cleveland hooked and battled a blue marlin and, when the fish was brought alongside the boat he made a remarkable request. The request was unheard of. He wanted Capt. Bill to let the marlin go, to give it it’s freedom, to let it live to fight again another day. Captain Bill did as requested and, in so doing, became the first captain to ever let a billfish go on purpose in North Carolina. At the time the act created negative comments, some cat calls and considerable skepticism. But, it also started a trend, a trend that grew and grew an eventually became the norm. Billfish “catch and release” is now the expected behavior of anglers and, of all its achievements, is probably the one in which the Albatross Fleet takes the most pride. By the end of the 1950’s the Hatteras charter fishing industry was very thoroughly established. The early captains, with no electronic navigation devices and very limited sport fishing experience had, through trial and error, developed skills and a body of knowledge that they eagerly passed on to the young men who worked as their mates. This knowledge had been hard gained through trial and error. They were all watermen, and the sons of watermen. Their navigation skills involved dead reckoning, a watch, a compass and a keen awareness of the few landmarks available (the best being Diamond Lightship, anchored in 30 fathoms). Having been on the water all their lives they picked up new ideas quickly but they still had to learn when and where the many species of fish that travel by Hatteras would be available. A private fishing club, the Hatteras Marlin Club, had been established and anglers from all over the world knew about and fished the waters off Hatteras. It was against this backdrop that, in the summer of 1962, Capt. Bill Foster cemented his position as a great captain. On the day before the Hatteras Marlin Club was to begin its annual blue marlin tournament Capt. Bill caught a big marlin. Keeping in mind that in those days there were not a lot of fishing tournaments and that each one attracted the attention of the entire sport fishing world. What it meant was that everyone who fished was watching Hatteras. Captain Ernal Foster with 810 pound new world record in 1962. Against that backdrop Capt. Bill took out a charter that included an angler named Gary Stukes. The marlin fishing had been a little slow for several days and when they caught a 250 lbs fish there was great excitement on the boat. The baits were redeployed and 10 minutes later there was another strike. Mr. Stukes was in the chair and with the first jump they knew the fish was special. How special? When the fish was brought to the dock and weighed it tipped the scales at 810 lbs. and that made it a new world record, the largest blue marlin anyone had ever caught! And that was big news, at the right time, in the right place and it gave the Albatross Fleet, Capt. Bill and Hatteras a significant place in angling history. These pioneering Captains left their mark on the world of sport fishing. Capt. Oliver ran the Albatross III until he retired in his seventies, Capt. Ernal and Capt. Bill were active in the fleet until they passed away in the ’90s. They were each instrumental in the development of the charter fishing industry of Hatteras and they left behind a tradition and a legacy that the Fleet carries forward today. 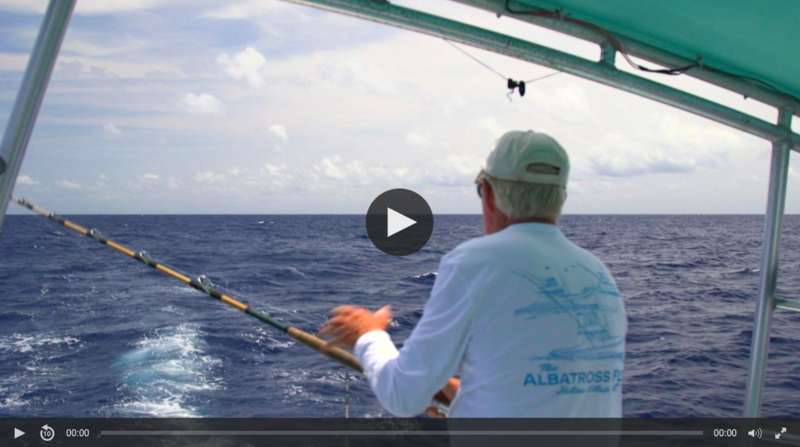 Learn the story of the Albatross Fleet, the first sport fishing charter on the Outer Banks.